Hello friends, Today I will tell you a method on how to sync Fitbit with iPhone. Users can connect iPhone with their Fitbit. I will also share a way on how to fix Fitbit not synced with iPhone. You can fix adjust all the error and connect your Fitness device with your iPhone 6, 7, 8 and X. You can synchronize your iPhone with Fitbit Fitness tracker and get all your data directly on your iOS device. Have you got yourself a brand new Fitbit and wanted to sync Fitbit with iPhone? Here is the full tutorial. No doubt that Fitbit is a great device to measure your health as a wear device. Also, it is not much costly as compared to other fitness brands such as Apple. Not only this but it also provides an accurate measure, soft to wear, and efficient at less price. That is why many of us purchase it. But, what if you don’t know how to sync Fitbit with iPhone? Yes, the article is all about the same. Move on to the other sections of the article for more knowledge. Before you start learning about how to sync Fitbit with iPhone, it is essential that you must have a Fitbit account for that. Without having a Fitbit account, you can not sync or even use the Fitbit product trouble free. This section will show you how you have to create an account for the Fitbit device though you can use it. I have explained the whole procedure which will take you to the creation of an account for Fitbit product. You can even contact Fitbit customer service directly. Go to the App Store and search for Fitbit app in it. Once you have found it then install it on your iPhone. Now, open the app and click on Join Fitbit button. Select your Fitbit model name which you have bought from the list. Enter your details and select the checkbox also then click Next. After that, enter your body details such as height, weight, etc. and click Create Account. On the Terms and Conditions page click, I Agree. That’s it. You have created a Fitbit account right now. After the successful creation of a Fitbit account this it the time when you gain the knowledge of how to sync Fitbit with iPhone. So that you can implement it on your Fitbit and iPhone to use it. 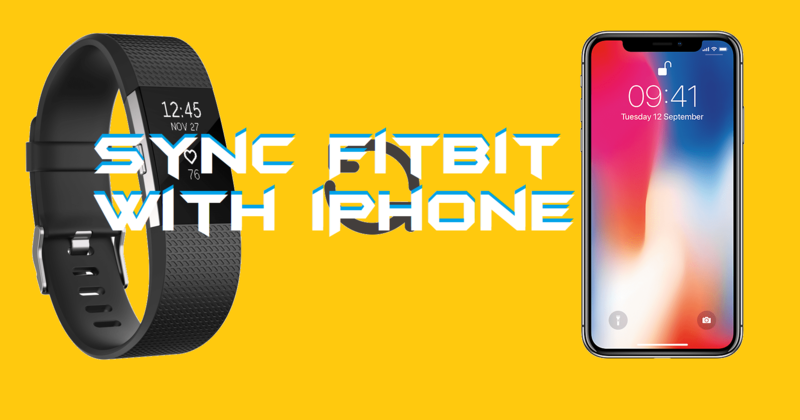 In this section, I have told you that what steps you have to follow to sync Fitbit with iPhone. There is no restriction that you can not use these steps when you are on different iPhone model such as iPhone 6, 7, 10, etc. This guide applies to all iPhone models and iOS versions. You can even setup Fitbit for Windows 10. After successfully created a Fitbit account move on to the next step. Click on the Account button which is at the top right side on the app. Click on Set up a device button and select your Fitbit model name. Now, plug your Fitbit to the charger and click on Next. The Fitbit app will automatically search for the Fitbit device. Once, the searching is complete, click on Next. Now, follow on-screen instructions and that’s it you are done. Once you have created a Fitbit account and followed the above procedure to sync Fitbit with iPhone but you get failed. Then, what should you do? Where is the fault? If I tell you in some words, then there is a fortunate chance that you have missed out something while syncing Fitbit with iPhone. So, the question arises here is what should you do to fix it and sync Fitbit with iPhone successfully. Well, in this section I have listed some common mistakes that may be done by you so have a look at it and fix it after that try again. Read this comparison on Apple watch vs Fitbit. Check that Fitbit’s battery is charged or not. Maybe that’s the reason, and it died. Force stop the Fitbit app and reopen it again. Maybe this helps you. Turn off Bluetooth connectivity and restart it then open the Fitbit app again. Reboot your iPhone. Sometimes rebooting helps a lot. Clear the user data of the Fitbit app. If nothing helps then reset your Fitbit tracker. We found that how we can create a Fitbit account and how to sync Fitbit with iPhone. Along with it, we also checked that what reasons may be present while we sync Fitbit with iPhone. This was the official way to sync Fitbit with iPhone. I hope that I have delivered simple and easy words to you in learning how to sync Fitbit with iPhone. However, if somehow you have missed something and got an error then follow the “Fitbit Not Synced with iPhone” section of the article. Share this article with your friends or colleagues that need to know about how to sync Fitbit with iPhone.